It really is almost Spring. I hate to break it to you, but it's true. Winter sure seemed to fly by and I think some sunshine, flowers, and fuzzy bunnies are well needed, don't you? 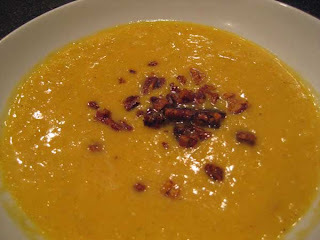 Well, if you want to hold on to that last little bit of winter, you could make a soup like this Butternut Squash Soup with Sweet and Spicy Pecans from the November 2007 issue of Every Day with Rachael Ray. The prep time is about 20 minutes and it will take a total cooking time of one hour, so don't expect this to be a 30 minute meal! I think I liked this version just as much, if not more, than the Roasted Garlic and Butternut Squash Soup that I tried last year. The pecans were really the dealbreaker, so make sure to make them! I made this before I was on my special diet, but I never realized that eating butternut squash is like eating a potato, carb wise. Did anyone else know that? I won't be eating this again until after Baby Miller arrives, so you'll have to enjoy this for me. It's very easy to make and doesn't require any special skills or tools, but having an immersion blender is handy. 2. Meanwhile, melt 1 1/2 tablespoons butter in a large soup pot over medium heat. Add the onion and celery, season with salt and pepper and cook, stirring occasionally, until softened, 6 to 7 minutes. 3. Melt the brown sugar and remaining 1 1/2tablespoons butter in a small skillet over medium-low heat. Add the pecans, chili powder and 1/2 teaspoon salt and cook, stirring, until the nuts are toasted, about 5 minutes. Let cool. 4. Scoop the squash flesh from the skins and add to the soup pot. Add the broth and milk and bring to a simmer, stirring occasionally. Using an immersion blender, puree the mixture in the pot, over low heat, until smooth (or transfer in batches to a blender and puree). Serve in bowls, topped with the pecans.